No two hikers are alike – in their experience, size, strength, comfort levels, ambition, motivation, fears, concerns and confidence level, and expectations. That’s part of what makes interesting the beast that an Appalachian Trail thru hike is. After more than 600 miles, I thought a gear review might be in order. Remember that this experience has been mine alone. Your or anybody else’s reality could be very different. First to recap. I hiked the 160 miles from Waynesboro, Va. (Rockfish Gap) to Harpers Ferry, WVa. starting Sept. 24th and finishing on Oct. 6th. During that period the daily high temperature ranged from 54 to 92 with about a week of each. The experience was instructive to say the least. I still can’t get the funk out of my sleeping bag. On Oct. 24th I started hiking north from Springer Mountain, Ga. with 13 days off for Thanksgiving. My marker is now in Damascus where I left the trail for Christmas, New Years, income tax and to file for Medicare. With so many people focused on starting early this spring, my hard learned lessons may be helpful to some. Philosophically, I am not an ultralight hiker. I’m not a tank either. Ever mindful of weight, I carry what I need to be comfortable, warm and safe. Just understand that I am willing to pay a weight tax in the areas that are important to me – but may not be important to anyone else. My spring/fall pack with 1 liter of water and five days rations weighs around 26 lbs. My full winter weight clocks in between 32 and 34 lbs. My pack itself is a Deuter Act lite 40 +10. That means that it’s basically a 40 liter pack with about 10 liters of expansion room. When I bought the pack, I thought that its size limitations would help impose some weight discipline. My catch phrase was: “If it don’t fit. It don’t go.” That’s been true, but if I were to do it over, I’d buy a 50 liter pack. Forty liters is very tight, but I have been able to make it work. Deuter packs have a brilliantly adjustable suspension. I have the build of a marathoner – which makes it hard to find a pack that fits. Deuter’s infinitely adjustable suspension helps my pack fit like a pair of comfortable old slippers. That’s the reason I’m staying with it. I also like its ability to create compartments which help me stay organized. That’s where my love affair ends. Deuter could improve all its packs tremendously with a few simple fixes. Watersealed seams and water resistant zippers would be more than helpful. This pack leaks like a sieve, even with a rain cover on. You listening Deuter? I really don’t like that. The hip belt could use properly sized (meaning large) side pockets on both sides. The one pocket it does have is on the right and far too small. Worse, it is located in such a way that I can’t see its contents. The left side has space to attach something – heaven knows what. There are no after market products specifically designed for this pack that could stimulate my imagination that I can find. I made do with a zippered item I found at REI. My sleep system works – barely. As a winter hiker I need to be prepared for ten below zero. I’m finding that zero is about the limit of real comfort. The system is based on a woman’s 25 degree dry down bag by Sierra Designs. My stature allows me to use a woman’s bag which saves about a pound of weight and $100 in cost. I really like the extra insulation they put in the area for your feet in a woman’s bag. The bag is supplemented with a silk liner – mostly for the purpose of absorbing grime and managing drafts. The question is, What happens when the temp threatens to plummet below 25 degrees? Since I can expect a huge range of temperatures on the trail during the winter, I have to have an adjustable clothing/sleeping system. To supplement both, I truck two puffy down jackets – one medium and one large so they fit inside one another. Then there’s the puffy down pants and booties. Combined, with clothing layers, I figured this system would easily get me to `10F. Not so. The sleeping bag itself is made of light weight fabric. 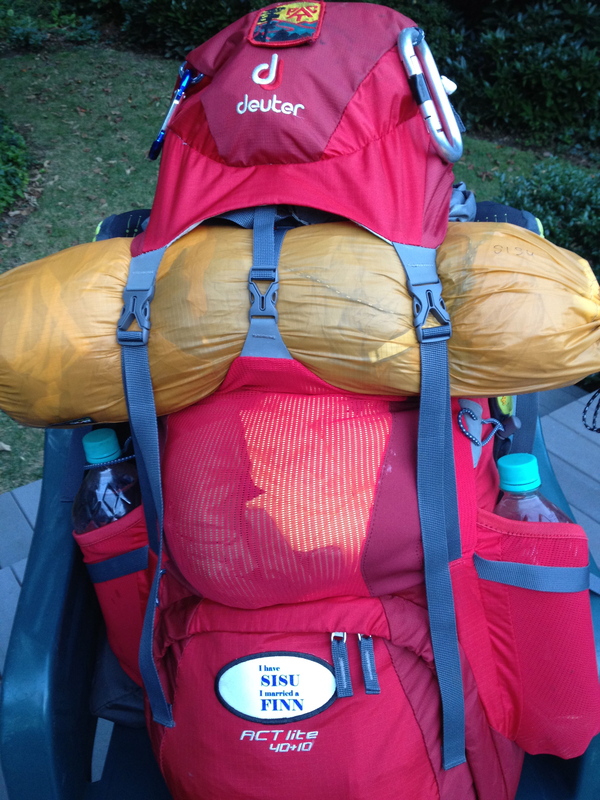 When stretched by water bottles and a butane fuel container, the bag develops cold spots when the temp nears zero. It hasn’t bothered me much, but I don’t like it. Moreover, the zipper snags both up and down because the fabric is so light. That’s not good. When I return to the trail after the holidays, I’m switching to my 1970’s zero degree bag. It’s bigger and heavier, but it is absolutely bullet proof to zero. With the puffies added, it’ll take anything mother nature can throw at it, and I’ll be more confident. I switched from a Pocket Rocket stove to a Jet Boil Sol. Since I cook exclusively in Zip Lock freezer bags, that was the right move. The size increase was miniscule. The efficiency increase is remarkable and well worth it. With the Pocket Rocket, I used up a full size butane cartridge about every 10 days. With the Jet Boil, the mini cartridge lasted 18 days with fuel to spare. I use a Zpacks food bag. It’s NOT waterproof. Moreover, it needed to be modified with an extra tiny snap link and some chord to make it easily hangable and operable with mittens. I’d buy it again. The size is about right for up to a week’s worth of food. Speaking of modifications, I’ve had to modify about everything – tent, rain jacket, food bag, and pack – for winter and mittens. Try and operate everything you own with mittens on before you actually hike. You’ll be surprised. My iPod and iPhone serve as communications and entertainment – the entertainment is mostly at night. Since lithium batteries suffer from cold, I carry three Mophies that will fully charge my iPhone a total of one time each, plus the charge in the phone itself. The priority is to the phone because I frequently text my wife and family where I am. I reserve one battery for my iPod which serves as evening entertainment. This arrangement usually works. I keep the phone in airplane mode most of the time and a battery usually lasts a couple of days, if not more. My rain gear – pants and jacket are traditional. They work. My jacket is a North Face with pit zips. It’s functional, but the chords that tighten the hood and waist are not designed to use with gloves or mittens. So much for the compromises necessary to honor North Face’s identity as a fashion brand. My clothing is in a Sea to Summit compressible dry sack. I carry an extra base layer, plus a sleeping shirt, four layers, a sleeping hat and three pair of socks in addition to the aforementioned down gear. That’s about it for equipment. I carry gloves and waterproof arctic mittens. My first aid kit services me and my equipment. My headlamp is a light weight single LED by Princeton Tec. I also carry one charging cable and iPad charger for each battery and electronic device I carry. There are not enough outlets at the hostels. They’ve not caught up to the 21st century in that regard. My return to the trail is indefinite. My mother is struggling with cancer. I may fly home to Colorado to be with her before continuing my hike. I also plan to sneak in the Grayson highlands between Christmas and the New Year with the help of the kind folks at Mt. Rogers Outfitters who will shuttle me 60 miles north so I can hike back to my car in Damascus. Once past Grayson, altitude will be less of a weather factor. ← Towns, Logistics, Zeros. They add up. We had a great time hiking with our grandkids in Blackwater Falls SP in WV last weekend. They took to it like troopers. The light snow was a blast for the three little boys. Snowballs were flying. My best to you and your mother. Thank you. Merry Christmas to you and yours.